The exhibition Under the Volcano takes inspiration from the 1947 novel of the same name by Malcolm Lowry. Set in the small Mexican town of Quauhnahuac, the book is considered a modernist masterpiece detailing the steady demise and violent death of mescal-soaked consul Geoffrey Firmin. He is a ruined man who cannot understand his place in the world. In keeping with the suffering and loneliness felt within the novel, the work of Martyn Cross similarly taps into the futility of life and existential crises of a man down on his uppers. We are encouraged to reflect upon the spiritual ambivalence of life that is increasingly homogenised and without hope: a perfect world that is crumbling into dust. The presented works therefore are an attempt to form some sense of civilisations’ flawed quest for perfection. By re-contextualising historical materials such as the visual utopia found in knitting patterns, uncanny impressions of suburbia bloom. The humble plastic carrier bag is altered through acts of vandalism and chance: self-destruction and dumb humour becoming channels to a strange new world. 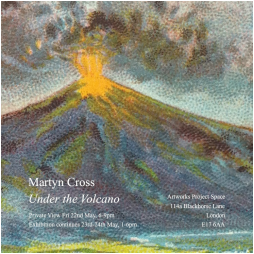 Martyn Cross lives and works in Bristol. The exhibition Under the Volcano is a result of being a prizewinner at the Barbican Artworks Open 2014, selected by Paul Johnson and David Kefford. Recent exhibitions include: Noisome Thoughts, Kings Arms, Bath; Limbo Associate Members Show, Margate; Sweat Lodge, Spike Island Test Space, Bristol; Take Me To The Other Side, Pallas Projects, Dublin; Like a monkey with a miniature cymbal, Aid & Abet, Cambridge; Edgelands, Angelika Studios, High Wycombe; Creekside Open, London; Temporary Residence, Kettles Yard, Cambridge.